President Maithripala Sirisena unveiling the plaque at ‘Jana Jaya City’ while others look on. 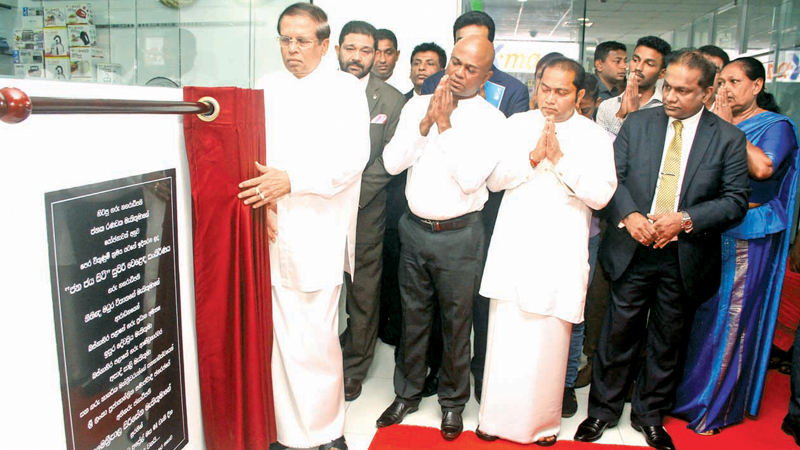 The ‘Jana Jaya City’ Supermarket Complex, built under a presale concept adding a new chapter to Sri Lanka’s development efforts, was vested with the people by President Maithripala Sirisena, yesterday. The Sri Jayewardenepura-Kotte Municipal Council and private investors funded the construction of the 10 storey supermarket complex costing Rs. 2,000 million, on a concept of former Sri Jayewardenepura Kotte Mayor Janaka Ranawake. The foundation stone for the building was laid on August 1, 2014. It is aimed at improving the revenue of the Sri Jayewardenepura-Kotte Municipal Council, while strengthening the country’s economy. The ‘Jana Jaya City’ supermarket complex is a mixed development project consisting of 420 trade stalls, hotels, a cinema hall and other modern facilities. Several government offices, including the Western Province Governor’s office, have been established in it. Former Mayor of Sri Jayewardenepura-Kotte Janaka Ranawake said the ‘Jana Jaya City’ supermarket complex would be a major source of income to the municipal council and the country’s economy. Kotte Rajamaha Viharaya Viharadhipati Ven. Aluthnuwara Anuruddha Thera, Western Province Governor Azath Salley, Chief Minister Isura Devapriya, Parliamentarians Thilanga Sumathipala and Lasantha Alagiyawanna and Sri Jayawardenapura-Kotte Mayor Madhura Vithanage were also present.